The degree to which a tiled surface will withstand friction and foot traffic wear. This is measured using an abrasion test and classifies tiles from 1 to 5 or provides it with an R rating in Australia in terms of the type of applications they are suited to(see PEI Rating). The wear rating of the tile has little to do with the quality or price, only durability. Some of the most expensive and luxurious tiles in the world rate only a 1 or a 2. Whether you require a non slip tile with an abrasion resistance will depend on whether you need a non slip surface for an area such as a pool or your industry requires it, such as in public wet areas, aged care facilities or food preparation areas. This is important in determining a tile’s sensitivity to stains. The size of the pores and their proximity are contributing factors. It is recognised that although a porcelain tile has a very low absorbency rate, polished porcelain may in fact be susceptible to staining as the polishing process can open miniscule pores on the very surface of the tile. A sealer prior to installation may be required. Tiles that have been treated, or specifically produced to reduce slipping. Not all tiles are made with a non slip surface but they can become non slip. Common processes are adding grit (corundum) to the glaze of a tile, or producing a tile with a structured or roccia surface, or adding studs dots or other raised features to a tile. Tiles can also be acid etched to increase the slip resistance factor. Maintenance has an effect on the overall slip resistance e.g. build-up of dirt and grease will decrease the slip-resistance of the tile surface. Nerang Tiles can advise you on a number of different methods and professionals that can acid etch your porcelain or ceramic floor tile or wall tile to make it slip resistant. All tiles are generally produced in batches. This is because they are either all made using one particular mix of dye or a certain type of clay. Generally batches will vary slightly in shade, colour and calibration (finished size). A certain degree of shade variation is inherent in all tiles, be it glazed or unglazed. The manufacturer will limit the amount of shade variation in a carton by sorting the tiles as they come off the production line. Manufacturers assign tiles a batch number to identify them as belonging to the same batch. When tiling a continuous area, tiles from the same batch should be used to ensure consistency in shade, colour and calibration. If tiling two or more separate areas then you can get away with different batches but you need to make sure the boxes don’t get mixed up between areas. Where the edge of a tile is angled rather than perpendicular to the face of the tile. Biscuit (Body)This is the structural part of the tile (i.e. singular from the glaze), or often the part the industry refers to when talking about the material or mixture from which the item is made. Tiles with a brushed finish have a worn-down look achieved by brushing the surface of the tile to simulate natural wear over time. This is generally made from red or white clay and from slightly different raw materials to porcelain tiles. Ceramic tiles are usually finished with a decorative glaze. Ceramic tiles are used for both wall and floor applications, but are 'softer' than porcelain tiles. Generally best suited to lighter wear traffic, ie residential rather than commercial & tend to carry a PEI of 1 to a maximum of 3 rating. They tend to be more prone to chipping and are less frost resistant than porcelain tiles due to their relatively high absorption rate. The measurement of resistance to friction as related to be effect of how smooth or rough a surface is to prevent material to "slip" across the surface. Coloured bodied tiles are created with continuous coloured stains from the glaze surface throughout the body of the tile. Synchronising the colour of both the glaze and body lessens the visibility of any chipping or scratches which may occur. The colour remains consistent throughout the tile, but any surface design does not continue through the tile body. This is an abrasive grit which is added to a tile glaze to increase its slip co-efficiency. First quality tiles must meet the standards of their class for length, width, thickness, straightness of sides, rectangularity, and surface flatness. All manufacturers will produce specifications for their ranges, normally outlined in promotional material such a catalogues, which rate these areas against the current standard. Where a porcelain tile goes through a press, is decorated and then sent through another press before entering the kiln. This is often used to produce the appearance of natural stone and also seals the surface so the porcelain is less porous and more durable. The final surface applied to the face of a tile that determines its visual and tactile characteristics. This refers to a porcelain tile where the colour and pattern run right through the entire thickness of the tile making it virtually impervious to wear, as the colour or pattern does not change even if the surface is worn down, scratched or chipped. Such tiles are typically suited to high traffic areas and commercial installations. Ceramic tiles that have been chemically altered during the firing process to produce a material that will hardly absorb water at all, typically with water absorptions below 0.5%. Porcelain is a fully vitrified ceramic. A ceramic biscuit that has been coated with an opaque glaze, usually for decorative purposes. Soft bodied, this is easy to cut and is mainly recommended for walls. Ceramic floor tiles are generally recommended only for residential use and low traffic installations. A very popular type of indoor tile. The body of the tile is made from porcelain, but colour/decoration is added to the surface for aesthetic purposes. Porcelain tiles are harder, the material more dense and as a result stronger than its ceramic counterpart. Generally, a wet saw is required for cutting during the installation process. Gloss tiles are sprayed with a glaze that produces a shiny, reflective surface after firing. These tiles resist dirt and stains and are easy to clean. As a result, they work well in high-maintenance areas that require frequent cleaning such as kitchen and bathroom walls. An undulating, textured finish that provides low-slip qualities, and can resemble natural rock. They are normally used for external areas and places that need extra traction (wet areas, for example). A tile finish also known as "Semi-Polished". Hardness of a tile’s surface is the measure of its resistance to a substance that will scratch or damage its surface. The hardness of a tile is directly related to the material it is made from, its density & its porosity. The MOH scale can be referred to for measurements of hardness and density. Honed tiles have a semi-polished to matt look, which is created by polishing using a mechanical procedure which does not remove any material of the tile. The result is a smooth with a soft look and a slightly duller colour than the polished tiles. Latest method of manufacturing tiles that allow for diversified designs on tiles so that no two tiles look the same. In this way, natural stone tiles can be replicated realistically. Small, sometimes decorative tiles used in combination with larger or plain tiles to create patterns. Small square inserts are also known as a taco or tozzetto. The edge of two tiles engage with each other by overlapping or fitting together to form a solid surface. The acronym stands for Leadership in Energy and Environment Design. The LEED Green Building Rating System was established by the U.S. Green Building Council. The system defines standards for environmentally responsible, healthier, and more profitable structures. Points are awarded to new construction and major renovation in five categories: Sustainable Sites, Water Efficiency, Energy & Atmosphere, Materials & Resources, and Indoor Environmental Quality. A condition where one edge of a tile is higher than the adjacent edges, giving the finished surface an uneven appearance. This can be avoided by using levelling systems like the Raimondi Levelling System. Narrow decorative border tile, often designed to compliment a range of field tiles. Matt tiles are smooth and flat and create a more informal and softer look. This finish is created by stopping short of the last stage of polishing. A matt finish shows fewer scratches, and requires very little maintenance. Scale used to express the measure of a material’s hardness from Mohs’ 1 (talc - softest) to 10 (diamond - hardest). Refers to the approximate size of a tile's upper face or thickness, used for a general dimension of the given product. This is normally in terms of a non-rectified tile as the mm measurement of length, width and thickness can vary slightly. Has water absorption of 7% or greater. Usually used as a wall covering and suited for indoor, dry area use only. This rating is established by the Porcelain Enamel Institute to rate the resistance of ceramic tiles to visible surface abrasion. Commonly referred to as "abrasion resistance", this is the most commonly used industry rating for wear. Ratings go from 1 to 5 with 5 being the most durable. To eliminate the possibility of choosing the wrong product, most manufacturers use the following P.E.I guide to rate the durability of each tile. Group 1: Tiles suitable for residential bathrooms where softer footwear is worn. Group 2: Tiles suited to general residential traffic, except kitchens, entrance halls, and other areas subjected to continuous heavy use. Group 3: Tiles suited for all residential and light commercial areas such as offices, reception areas and boutiques. Group 4: Tiles suited for medium commercial and light institutional applications such as restaurants, hotels, hospital lobbies and corridors. Group 5: Tiles suitable for heavy traffic and wet areas where safety and maximum performance are a major factor such as exterior walkways, food service, salad bars, building entrances, around swimming pools or shopping centres. Where the straight edges of a tile have been rounded and softened, giving the tile a pillowed look. This refers to a tile made from porcelain clays using a dust pressed method resulting in a tile that is dense, impervious, fine grained and smooth, and with very square sharp sides. This tends to make them frost resistant and the perfect material for external installations. Dense unglazed tile that is generally 6" or more in surface area and less than 3/4" thick. Use mostly in commercial spaces because of its slip resistant qualities. Unlike a typical factory-edged tile, a rectified tile has been cut to size after the firing process. This process creates a precise, 90 degree angle edge and, as a result, can be laid with a tighter grout joint than an un-rectified tile. This gives a smoother, more sophisticated and continuous look to the room overall. A natural material that is known for its dynamic colors and "earthy" appeal. Slate is used outside as well as inside because of its natural look and wonderful colors. Because slate is a product of nature, it is characterized by a high shade variation. Semi-polished, also known as “lappato” finish is achieved by polishing the tile’s surface with an abrasive wheel but not long enough to attain the luster of a typical polished tile. As recent advances in technology have allowed for increased flexibility in colour variation between tiles, a scale has been introduced to communicate the degree of variation intended. The degree of shade variation expresses the level of uniformity of colour between the tiles in the same series. Unlike regular tiles which are commonly 9-11mm thick, slim tiles are only 3-5mm thick, but have comparable strength. This makes them ideal for renovations as they can be laid on top of existing tiles, thereby saving on demolition costs. Where the face of the tile is changed during the forming process from a flat to a textured surface. This texture can take many forms, ranging from a rough random texture to protruding geometric shapes. These are tiles which have been precisely calibrated. They have been used extensively in the UK and Europe. Typically the tile is compact and vitrified with a low porosity rate. These tiles normally feature patterns and geometric decorations and the potential to create unique decorations depending on taste is vast. The ability of a tile to resist alteration when subjected to rapidly fluctuating extreme temperatures. Fully vitrified tiles are made from fine particles and fired to high temperatures (1250 degrees) which results in a denser tile with extremely low porosity (moisture absorption of less than 0.5%). Porcelain stoneware tiles are fully vitrified making a layer of glaze unnecessary for the tile to be impervious to water. Used to define the excess tiles that may be required to factor in cutting. Generally this is 10% of the quantity required. However if the installation is complicated or involves a lot of cutting or a very large tile is being used, the amount of wastage may need to be increased. It is important to factor in sufficient wastage when you purchase your tiles because if you do find yourself short, you may not be able to get tiles from the same batch later. A rule stating that with given concrete materials and conditions of test the ratio of the amount of water to the amount of the cement in the mixture determines the strength of the concrete provided the mixture is of a workable consistency. (See also Water cement ratio). Ability of a surface to resist being worn away by rubbing and friction. The relationship of the weight of the water absorbed by a ceramic specimen subjected to prescribed immersion procedure, to the weight of the dry specimen, expressed in percent. (ASTM C 242). Ceramic or non-ceramic articles, affixed to or inserted in tile work, as exemplified by towel bars, paper, soap and tumbler holders, grab bars and the like. A grout that resists - Acidity. Effect of prolonged contact with acids and alkalis. A general term applying to substances on the acid side of neutral -principally the degree of acidity. (d) Conditions of use, that is, hot-setting adhesive. Used for bonding tile to a surface. Rubber solvents; and rubber and resin-based emulsions can be used as adhesives. Organic adhesive used for bonding tile to a surface. Rubber solvents and resin-based and rubber emulsions can be used as adhesives. An adhesive having a volatile organic liquid as a vehicle. Note: This term excludes water based adhesives. Unburnt brick dried in the sun. Aggregate, of low specific gravity, such as expanded or sintered clay, shale, slate, diatomaceous shale, perlite, vermiculite, or slag; natural pumice, scoria, volcanic cinders, tuff, and diatomite; sintered fly ash or industrial cinders; used to produce lightweight concrete. The capability of a material or process to develop a system of minute bubbles of air in cement, mortar, or concrete during mixing. A condition where soft-body clay, after absorbing moisture and being exposed to the atmosphere, will spall a piece of clay and/or glaze. A chemical substance which effectively neutralizes acid material soaps to form neutral salts. A base. The opposite of acid. Examples are ammonia and caustic soda. A vitreous ceramic white ware for technical application in which alumina (A1203) is the essential crystalline phase. (ASTM C 242). Any ceramic white ware in which alumina (A1203) is the essential crystalline phase. (ASTM C 242). Masonry composed of squared stones; one pattern of masonry construction. Steam curing of concrete products, sand-lime brick, asbestos-cement products, hydrous calcium silicate insulation products, or cement in an autoclave at maximum ambient temperatures generally between 340-420 F (176-215 C). The angle divider is used by the tile setter to determine the degree of an angle to cut. It is used for fitting trim, mouldings, and floors into corners. A corner angle is measured by adjusting the divider to fit the corner. A pressure vessel in which an environment of steam at high-pressure may be produced; used in the curing of concrete products and in the testing of hydraulic cement. The spreading of a bond coat to the backs of ceramic tile just before the tile is placed. The wall facing an observer who is standing at the entrance to a room, shower, or tub shower. Any material used as a base over which ceramic tile is to be installed. See Substrate. See Feather edging tile. Angle tile. Cuts of tile at the perimeter of an area that will not take full tiles. The cuts on opposite sides of such an area shall be the same size. The same sized cuts will be placed on each side of a mitre. A secondary clay, commonly characterized by the presence of organic matter, high plasticity, high dry strength, long vitrification range, and a light colour when fired. (ASTM C 242). A method of grinding and mixture material, with or without liquid, in a rotating cylinder or conical mill partially filled with grinding media such as balls or pebbles. (ASTM C 242). A rigid device used to support or hold reinforcing bars in proper position to prevent displacement before or during concrete placement. A black unglazed vitreous ceramic ware having the appearance of basalt rock. (ASTM C 242). One or more rows of tile installed on a vertical surface above the floor. See Cove. The method of determining whether a lot of ceramic tile is acceptable under these specifications. A machine that mixes batches of concrete or mortar in contrast to continuous mixer. An operating installation of equipment including batchers and mixers as required for batching or for batching and mixing concrete materials; also called mixing plant when equipment is included. A wooden block used to embed tiles in a flat plane. The method used is called beating in. A highly translucent white ware composed of a body containing significant amount of frit and normally having a lustre glaze. (Produced commercially at Belleek, Ireland.) (ASTM C 242). Permanent reference point or mark. Clay composed principally of minerals of the montmorillonoid group, characterized by high absorption and very large volume change with wetting or drying. Beryllium oxide (barilla) (Be) an inorganic material of exceptionally high thermal conductivity which is toxic in the powder form. Method for producing tile by firing it twice (first fire is for body, second is to fuse glazes or patterns in glaze onto the body).Usually, there are two glazes on the tile, first a non-transparent glaze on the body, then a transparent glaze on the surface. Glazed-over chips on the edge or corner of the body of a tile. Any fractures in the body of a tile visible both on face and back. The fineness of powdered materials such as cement and pozzolans, expressed as surface area usually in square centimetres per gram, determined by the Blaine apparatus. A small blister or bubble. The autogenous flow of mixing water within, or its emergence from newly placed concrete or mortar; caused by the settlement of the solid materials within the mass; also called water gain. To mix or make homogeneous. The development during firing of enclosed or broken macroscopic vesicles or bubbles in a body, or in a glaze or other coating. (ASTM C 242). A square of tile specially made for changing direction of the trim such as butterfly or down angle. A visible exudation or efflorescence on the surface. Marks or stains on the face of a tile. The wet process of blending, or suspending ceramic material in liquid by agitation. (ASTM C 242). The structural portion of ceramic article. This term also refers to the material or mixture from which the article is made. (ASTM C 242). The structural portion of a ceramic tile. This term also refers to the material or mixture from which the tile is made. The adherence of one material to another. A material used between the back of the tile and the prepared surface. Suitable bond coats include pure Portland cement, Dry-Set Portland cement mortar, latex-type Portland cement mortar, organic adhesive, and the like. A bond coat’s ability to resist separating from the tile and setting bed. Measured in pounds per square inch (psi). A substance applied to a substrate to create a bond between it and succeeding layer. Such as between a subsurface and a terrazzo topping or a succeeding plasters application. Calcined bone consisting essentially of calcium phosphate. (ASTMC 242). Translucent china made from a ceramic white ware body composition containing a minimum of 25 percent bone ash. (ASTM C 242). Essentially a box screed is a jig used to apply mortar onto the backside of large-sized ceramic, marble and granite tiles which may vary in thickness, in order to achieve a uniform unit of thickness of the tile and mortar combined. The brick trowel is larger than the buttering trowel. The most popularize used by tile setters is 5” wide and 11” long. It is used when any preparatory brick work has to be done. Some tile setters use it for quarry and terra cotta tile work. Its greater surface and weightage advantageous in the buttering and tapping in of the larger tiles. Tile produced by several methods to simulate the appearance of brick. A straightedge used as a starting line for the laying of tile. The straightedge can be blocked up to support tile over an opening. The slab or other structure forming the travel surface of a bridge. Colourless or coloured ceramic glaze having high gloss. (ASTM C242). The second coat in three-coat plaster application. The official charged with administration and enforcement of the applicable building code or his duly authorized representative. Increase in the bulk volume of a quantity of sand in a moist or wet condition over the volume of the same quantity of dry sand. Graph of change in volume of a quantity of sand due to change in moisture content. Ratio of the volume of moist sand to the volume of the sand when dry. A tool comprising a large, flat, rectangular piece of wood, aluminum, or magnesium usually 8 in. (20 cm) wide and 42 to60 in. (100 to 150 cm) long, and a handle 4 to 16 ft. (1 to 5cm) in length used to smooth unformed surfaces of freshly placed concrete. A type of bullnose trims with a convex radius on two adjacent edges. A coarse fabric of jute, hemp, or less commonly, flax, for use as a water-retaining covering in curing concrete surfaces; also called Hessian. A hammer that has a rectangular head with serrated or jagged faces. The bush hammer is used for roughing concrete to provide a bond for masonry. A slang term for corner angles for trim shapes such as AB 106, AF105, AF 200, AK106, and AU 106. A plain square joint between two members. A term commonly used for inside corner angles for trim shapes such as AB 106, AF 105, AF 200, AK 106, and AU 106. The spreading of a bond coat (followed by a mortar coat, a thin-setting bed mortar, or an organic adhesive) to the backs of ceramic tile just before the tile is placed. Tile that have projections on the bondable side. Many of these projections are round and therefore the term button back. Some projections are quite thick and can also be other shapes, such as square. A ceramic mineral or mixture fired to less than fusion for use as constituent in a ceramic composition. (ASTM C 242). A deflection that is intentionally built into a structural element or form to improve appearance or to nullify the deflection of the element under the effects of loads, shrinkage and creep. Mortar or concrete which is deposited in the place where it is required to harden as part of the structure, as opposed to precast concrete. Forming ceramic ware by introducing a body slip into a porous old which absorbs sufficient water from the slip to produce a semi rigid article. (ASTM C 242). Forming ceramic ware by introducing a body slip into a porous old which usually consists of two major sections, one section forming the contour of the inside of the ware and allowing a solid cast to form between the two mild faces. (ASTM C 242). Forming ceramic ware by introducing a body slip into an open porous mild, and then draining off the remaining slip when the cast has reached the desired thickness. (ASTM C 242). A soft, plastic material consisting of pigment and vehicle, used for sealing joints in buildings and other structures where normal structural movement may occur. Caulking compound retains its plasticity for an extended period after application. It is available in forms suitable for application by gun and knife and in extruded preformed shapes. A cementitious mixture of Portland cement, sand or other ingredients and water which produces a water resistant, uniformly colored material used to fill joints between tile units. A cementitious mixture of Portland cement, sand or other ingredients and water which is used for bonding tile to back-up material. Hydraulic cement produced by pulverizing clinker consisting essentially of hydraulic calcium silicates, and usually containing one or more of the forms of calcium sulphate as an underground addition. Portland cement which hydrates to a white paste; made from raw materials of low iron content, the clinker for which is fired by reducing flame. Portland blast-furnace slag cement, Portland-pozzolan cement, natural cement, slag cement or hydraulic lime; and in addition usually containing one or more materials such as hydrated lime, limestone, chalk, calcareous shell, talc, slag, or clay, as prepared for this purpose. Tiles with the body made from a mixture of sand and Portland cement. The surface may be finished with Portland cement, spheroids of marble or other materials. A scale of temperature which features 0oand boiling point of water respectively. To convert centigrade to Fahrenheit multiply by 1.8 and add 32, e.g., (100o32=212oF. An article having a glazed or unglazed body of crystalline or partly crystalline structure, or of glass, which body is produced from essentially inorganic, non-metallic substances and either is formed from a molten mass which solidifies on cooling or is formed and simultaneously or subsequently matured by the action of the heat. (ASTM C 242). An unglazed tile formed by either the dust-pressed or plastic method, usually 1/4 to 3/8 in. (6.4 to 9.5 mm) thick, and having facial area of less than 6 in. and which is usually mounted on sheets approximately 2 by 1 ft. (0.3 by 0.6 m) to facilitate setting. Ceramic mosaic tile may be of either porcelain or natural clay composition and may be either plain or with an abrasive mixture throughout. (ASTM C 242). A French term synonymous with “ceramic body.” (ASTM C 242). And suitable for utilitarian and decorative purposes by the action of heat at temperatures sufficient to cause sintering, solid-state reactions, bonding, or conversion partially or wholly to the glassy state. (ASTM C 242). A ceramic surfacing unit, usually relatively thin in relation to facial area, made from clay or a mixture of clay; and other ceramic material, called the body of the tile, having either a “glazed “or “unglazed” face, and fired above red heat in the course of manufacture to a temperature sufficiently high to produce specific physical properties and characteristics. A fired ware consisting of a glazed or unglazed ceramic body which is commonly white and of fine texture. This term designates such products as china, porcelain, semi vitreous ware and earthenware. (ASTM C 242). A general term applied to the art or technique of producing articles by a ceramic process, or to the articles so producing. (ASTM C242). Usually cotton cord coated with chalk. The cord is snapped to markka straight line. The chalk line is used to align spots or screeds. Short shallow cracks on the surface. Chemical porcelain. Vitreous ceramic white wares used for containing, transporting, or reacting of chemicals. (ASTM C 242). A glazed or unglazed vitreous ceramic white ware used for nontechnical purposes. This term designates such products as dinnerware, sanitary ware, and art ware when they are vitreous. (See also Bone china.) (ASTM C 242). Cx1.8)-fired to maturity, following which the glaze is applied and maturedby firing at a lower temperature. (ASTM C 242). Glazed, vitrified white ware fixtures having a sanitary service function. (ASTM C 242). Caused from the same reasons as given under “pitted” or by rough handling and confined to the corners and edges of the tile. The chipping hammer is a lightweight hammer that comes in a variety of sizes. The head and back can be capped with tungsten carbide for durability. It is used by the tile setter to chip excess material from the backs and edges of wall and quarry tiles, thus reducing the amount of grinding work necessary to smooth a cut. The scaling or breaking off at the edges of fragments from the surface of a tile, as might result from rough handling. A natural mineral aggregate, consisting essentially of hydrousaluminum silicates; it is plastic when sufficiently wetted, rigid when dried end masse, and vitrified when fired to a sufficiently high temperature. (ASTM C 242). A colourless or coloured transparent ceramic glaze. (ASTM C 242). Any point in a tile installation where tile and setting bed have terminated and the surface has lost its plasticity before work is continued. Visible lines on the surfaces of formed concrete indicating the presence of joints where one layer of concrete had hardened before subsequent concrete was placed. (See also Cold joint). The aspect of the appearance of an object dependent upon the spectral composition of the incident light, the spectral reflectance of transmittance of the object, and the spectral response of the observer. Commercially prepared grout consisting of carefully graded aggregate, Portland cement, water dispersing agents, plasticizers and colour fast pigments. (CTI). A member used primarily to support axial compression loads and with a height of at least three times its least lateral dimension. The process whereby the volume of freshly placed mortar or concrete is reduced to the minimum practical space usually by vibration, centrifugation, tamping, or some combination of these; to mild it within forms or melds and around embedded parts and reinforcement, and to eliminate voids other than entrained air. The measured maximum resistance of a concrete or mortar specimen to axial loading; expressed as force per unit cross-sectional area; or the specified resistance used in design calculations, in the U.S. customary units of measure expressed impounds per square inch (psi). An apparatus which forces concrete to the placing position through pipeline or hose. Concrete, prestressed. See prestressed concrete. Concrete containing, dispersed, randomly oriented fibres. Concrete delivered or mixed, placed, and cured on the job site. Concrete made very light and cellular by the addition of prepared foam or by generation of gas within the unhardened mixture. Concrete which has set but not appreciably hardened. And normal- weight aggregates. Structural lightweight concrete air-dry density ranges from 85 to 115 PCF and compressive strengths in excess of 2500 PSI. Marble-aggregate concrete that is cast-in-place precast and ground smooth for decorative surfacing purposes on floors and walls. Usually refers to liquid drops which form when a vapour is chilled below its boiling point. Also refers to water droplets that deposit on surfaces whose temperature is below the dew point. Conductive (adj.) Having the quality or power of conducting or transmitting heat, electricity, or static electricity. A tile mortar to which specific electrical conductivity is imparted through the use of conductive additives. Tile made from special body compositions or by methods that result in specific properties of electrical conductivity while retaining other normal physical properties of ceramic tile. Stained tile as a result of carton and tile being saturated by moisture, oils, solvents or other materials. The method of installing ceramic tile with Portland cement mortar. The material or units used to form a cap or finish on top of a wall, pier, pilaster, or chimney. A projection from the face of a beam, girder, column, or wall used as a beam seat or a decoration. A vitreous ceramic white ware for technical application in which cordierite is the essential crystalline phase. (ASTM C 242). A ceramic white ware in which cordierite is the essential crystalline phase. (ASTM C 242). The eating and wearing away by chemical action (pitting, rusting). A trim tile unit having one edge with a concave radius. A cove issued to form a junction between the bottom wall course and the floor or to form an inside corner. A trim tile having a concave radius on one edge and a convex radius with a flat landing on the opposite edge. This base often issued as the only course of tile above the floor tile. A measure of the amount of material required to cover a given surface. The ability of a glaze to uniformly and completely cover the surface of the fired water. (ASTM C 242). Reinforcement in concrete construction designed to prevent opening of cracks, often effective in limiting them to uniformly distributed small cracks. Tiles that have actually been cracked in one or more pieces usual during the beating in process of installation. These will show up as hairline cracks. Prevention of transfer of cracks from the substrate through the tile or stone when substrate is subjected to horizontal movement of cracks. The cracking which occurs in fired glazes or other ceramic coatings due to critical tensile stresses. (ASTM C 242). Tune-dependent deformation due to sustained load. A curvature of the sides, either convex or concave, measured along the sides. The degree of crook is the departure from the straight line between two corners, expressed in percentage of the tile length. A slang term used to describe tile joints that are out of alignment. A system in which a favourable temperature is maintained in freshly-placed concrete by supplying heat generated by electrical resistance. Curing, steam. See Steam curing. The distortion of an originally essentially linear or planar member into a curved shape such as the warping of a slab due to creeper to differences in temperature or moisture content in the zones adjacent to its opposite faces. Tile on which the facial edges have a distinct curvature that resulting a slightly recessed joint. A slang term used to describe the use of a fresh mortar screed in lieu of float strips to rod floor mortar. This method is commonly used in floor work. Terrazzo workers use this technique to align “concrete” for placement of brass or aluminium strips to the desired grade. A slang term used by tile setters when referring to a small piece of wood used to rod off mortar that has been applied to fill the holes caused by the removal of float strips. A hand-manipulated straightedge, usually 3 to 5 ft. (1 to 2.5) long, used in the early stage levelling operations of concrete or plaster, preceding supplemental floating and finishing. Portland cement plaster coats; sometimes used as a final finish on plaster. Mortar commonly used for decks or floors. It consists of sand and regular Portland cement mixed with water to a firm consistency. Adorned, embellished, or made more attractive by means of colourer surface detail. (ASTM C 242). See Decoration, in glaze; Decoration, over glaze; Decoration, underglaze. A ceramic decoration applied on the surface of an unfired glaze and matured with the glaze. (ASTM C 242). A ceramic or metallic decoration applied and fired on the previously glazed surface of ceramic ware. (ASTM C 242). A ceramic decoration applied directly on the surface of ceramic ware and subsequently covered with a transparent glaze. (ASTMC 242). A variation in position or shape of a structure or structural element due to effects of load or volume change, usually measured as linear deviation from an established plane rather than an angular variation. Calcareous earthenware having an opaque white glaze and monochrome over glaze decorations. (Originated in Delft, Holland. )(ASTM C 242). Departure of colour from that which is normal or desired. In terrazzo work, nonferrous metal or plastic strips of different thickness, and embedded depths usually 5/8 to 1/4 in. (10 to 40mm), used to form panels in the topping. The double carbonate of lime and magnesia having the general formula CaCO3 MgCA3. (ASTM C 242). Neat cement applied to the setting bed. A steel pin, commonly a plain round steel bar, which extends into two adjoining portions of a concrete construction, as at a joint in a pavement slab, so as to connect the portions and transfers hear loads. Also, as used in the construction of column and wall sections, a deformed steel reinforcing bar placed so as to transmit tension or compression as well as shear loads. Rough edges and corners of glazed ceramic ware due to insufficient glaze coating. (ASTM C 242). Dry mix. See Process, dry. Placing of zero slumps, or near zero slumps, concrete, mortar, or grout by ramming into a confined space. A water-retentive hydraulic cement mortar usable with or without sand. When this mortar is used, neither the tile nor walls have Tobe soaked during the installation process. Removal by evaporation, of uncombed water or other volatile substance from a ceramic raw material or product, usually expedited by low temperature heating. (ASTM C 242). The application of dry Portland cement to a wet floor or deck mortar surface. A pure coat is thus formed by suction of the dry cement. A cut tile used as filler in the run of a wall or floor area. A 6”x3/4” outside corner trim shape. (AC 106) Earthenware. Glazed or unglazed no vitreous ceramic white ware. (ASTM C 242). A type of mounted tile. Tile is assembled into units or sheets and is bonded at the edges or corners of the back of the tiles by an elastomeric or resinous material which becomes an integral part of the tile installation. Units or sheets must meet criteria mounted sheets. See definition for Mounted tile. See definition for Rerouted tile. A finishing tool used on the edges of fresh concrete to provide abounded corner. The texture of a fired glaze similar in appearance to the surface of an eggshell. (ASTM C 242). Vitrified white ware having an electrical insulating function. (ASTMC 242). Production of chemical changes by the passage of current through an electrolyte. A natural material, for example, rubber, or a synthetic material. For example, polyvinyl, that has elastic properties. A decoration in relief or excised on the ware surface. (ASTM C242). A slip coating applied to a ceramic body for imparting color, opacity or other characteristics, and subsequently covered with ablaze. (ASTM C 242). A two-part adhesive system employing epoxy resin and epoxy hardener used for bonding of ceramic tile to back-up materials. A two-part grout system consisting of epoxy resin and epoxy hardener, especially formulated to have impervious qualities, stain, and chemical resistance used to fill joints between tile units. An epoxy composition used as a chemical resistant setting adhesive or chemical-resistant grout. The composition within a system of two or more components which, on heating under specific conditions, develops sufficient liquid to cause deformation at minimum temperature. (ASTM C242). Eutectic equilibrium (eutectic). The composition within any system of two or more crystalline phases which melts completely at minimum temperature, or temperature at which such composition melts. (ASTM C 242). That portion of the facial surface of the tile which is readily observed to be nonconforming and which will detract from the aesthetic appearance or serviceability of the installed tile. Faience that are less than 6 in in facial area, usually 5/16 to3/8 in. (8 to 9.5 mm) thick, and usually mounted to facilitate installation. (ASTM C 242). Glazed or unglazed tile, generally made by the plastic process, showing characteristic variations in the face, edges, and glaze that give a handcrafted, no mechanical, decorative effect. (ASTMC 242). Designating decorated earthenware having a transparent glaze (ASTM C 242). Spacing tile joints to widen certain areas so they will conform to section that is not parallel. A flat member or band at the surface of a building or the edge beam of a bridge; exposed eve of a building; often inappropriately called fascia. Mortar placement such as a patch or topping that is bevelled at an acute angle. The method of chipping away the body from beneath a facial edge of a tile in order to form a mitre. A narrow strip of tile that has a contrasting colour, texture, or design. The name for products made of or with glass fibres ranging from5 to 600 hundred-thousandths inch in diameter. Used for making textile fabrics and for heat or sound insulation. Tile other than trim tile covering a wall or floor. The time required for a freshly mixed cement paste, mortar or concrete to achieve final set. See Fire, bisque; Fire, decorating; Fire, glost; Fire, single. An earthy or stony mineral aggregate which has as the essential constituent hydrous silicates of aluminium with or without free silica, plastic when sufficiently pulverized and wetted, rigid when subsequently dried, and of suitable refractoriness for use in commercial refractory products. A factor obtained by adding the total percentages by weight of an aggregate sample retained on each of a specified series of sieves, and dividing the sum by 100. In the United States the standard sieve sizes are No. 100 (150 pm), No. 30 (600 we), No. 16(1.18 mm), No. 8 (2.36 mm) and No. 4 (4.75 mm), and a/s in. (9.5 mm), 3/a in. (19 mm), 11/2 in. (38,1 mm), 3 in. (75 mm),and 6 in. (150 mm). The process of kiln-firing ceramic ware prior to glazing. (ASTM C242). The process of firing ceramic or metallic decorations on the surface of glazed ceramic ware. (ASTM C 242). The process of kiln-firing bisque ware to which glaze has been applied. (ASTM C 242). The process of maturing an unfired ceramic body and its glaze in one firing operation. (ASTM C 242). The controlled heat treatment of ceramic ware in a kiln or furnace, during the process of manufacture, to develop the desired properties. (ASTM C. 242). The range of firing temperature within which a ceramic composition develops properties which render it commercially useful. (ASTM C242). Irregularities left on the edge of the tile mainly due to the use of machine cutting tools. Capable of being easily ignited. The temperature at which the material gives off flammable vaporing sufficient quantity to ignite momentarily on the application of aflame under specified conditions. The final mortar coat over which the neat coat, pure coat, or skim coat is applied. A strip of wood about 1/4” thick and 1-1/2” wide. It is used as a guide to align mortar surfaces. A method of using a straightedge to align mortar with the float strips or screeds. This technique also is called dragging, pulling, rodding, or rodding off. An inorganic mineral of the isometric form, used as a source of fluorine for fluxing of glasses and glazes. A substance that promotes fusion in a given ceramic mixture. (ASTM C 242). 1. Storage of concrete in a moist room in which the desired high humidity is achieved by the atomization of fresh water. (See also moist room).2 Application of atomized fresh water to concrete, stucco, mortar, or plaster. Oil applied to interior surface of formwork to promote easy release from the concrete when forms are removed. The shaping or melding of ceramic ware. (ASTM C 242). A vitreous ceramic white ware for technical application in which forsterite (2MgO Silo) is the essential crystalline phase. (ASTM C242). Any ceramic white ware in which Forsterite (2MgO - Silo) is the essential crystalline phase. (ASTM C 242). The application of wall mortar without the use of guide screeds. This technique is used by specialists when they are setting glass mosaic murals. A glass which contains fluxing material and is employed as constituent in a glaze, body or other ceramic composition. (ASTMC 242). A glaze in which a (ASTM C 242). A two-part mortar system of furan resin and furan hardener used for bonding tile to back-up material where chemical resistance of floors is important. Plastics based on resins in which the furan ring is an integral part of the polymer chain, made by the polymerization -orpolycondensation of furfural, furfural alcohol, or other compounds containing a furan ring, or by the reaction of these furan compounds with other compounds, the furan being in greater amount by weight. Catalyst. Fillers are generally carbon, silica or a combination thereof into which the acid catalyst, or setting agent, may be incorporated. When combined, the components form a flowablechemical resistant material for grouting tile. A furan resin composition used as a chemical-resistant setting adhesive or chemical-resistant grout. A two-part grout system of furan resin and furan hardener used for filling joints between quarry tile and pavers where chemical resistant properties are required. Stripping used to build out a surface such as a studded wall where strips of suitable size are added to the studs to accommodate vent pipes or other fixtures. The process of melting; usually the result of interaction of two or more materials. (ASTM C 242). A device used in determining time of setting of hydraulic cement. A backer board designed for use with ceramic tile in wet areas. Incan is used in place of metal lath, Portland cement scratch coat and mortar bed. A ceramic coating matured to the glassy state on a formed ceramic article. The term glaze also refers to the material or mixture from which the coating is made. (ASTM C 242). Bright glaze. A high-gloss coating with or without colour. (ASTM C 242). Clear glaze. Transparent glaze with or without colour. (ASTM C 242). Crystalline glaze. A glaze that contains microscopic crystals. (ASTM C242). Fritted glaze. A glaze in which a part or all of the fluxing constituents are perfused. (ASTM C 242). Matt glaze. A low-gloss ceramic glaze with or without colour. (ASTM C 242). Opaque glaze. A no transparent glaze with or without colour. (ASTM C 242). Raw glaze. A glaze compounded primarily from raw constituents. It a medium-gloss ceramic glaze with or without colour. (ASTM C242). Speckled glaze. A glaze containing granules of oxides or ceramic stains that are of contrasting colours. The stress relationship between the glaze and body of a fired ceramic product. (ASTM C 242). subject to freezing and thawing conditions. (ASTM C -242). See Pavers. Glazed quarry tile. See Quarry tile. Glazed tile. Tile with fused impervious facial finish composed of ceramic materials, fused into the body of the tile which may be a no vitreous, semivitreous, vitreous, or impervious body. The glazed surface maybe clear, white, or coloured. (ASTM C 242). Glazed tile, extra duty glaze. Tile with a durable glaze that is suitable for light duty floors and all other surfaces on interiors where there is no excessive abrasion or impact. (ASTM C 242). A predetermined degree of slope for floors requiring drainage. Grades of tile recognized in ANSI standard specifications for ceramic tile. The grout saw is a saw-toothed carbide steel blade mounted oak wooden handle. It is used to remove old grout. It also is used in patching work. Care should be used as it can easily damage adjacent tiles. The carbide steel blade is brittle, and it will shatter if it is dropped or abused. On front of the saw blade is a spring steel tip, used for scraping grout out of corners where the saw blade cannot reach. A no scratch nylon pad impregnated with abrasive used for cleaning grout off tile. Hairline cracking. A mortar screed that has become firm. 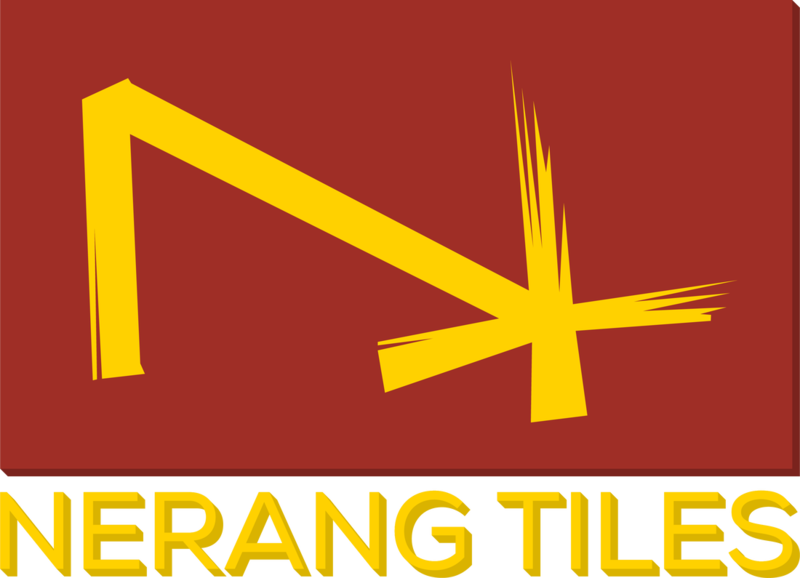 A term used in the tile trade to designate types of tile, such as ceramic, glass mosaic, marble tile, etc. over which the tile trade has jurisdiction. Hard tile as compared to resilient tile. Hawks range in size from 10” to 14” square, but tile setters generally prefer the 11” square. Most hawks are made of aluminium with wooden handle at the centre. A rubber pad fits over the handle and covers that portion of the metal hawk that would come in contact with the hand. The hawk should not be held with a hand that is wet or covered with lime or mortar. The ability of a glaze to heal surface blemishes during firing. (ASTMC 242). Tile suitable for areas where heavy pedestrian traffic is prevalent. Tile can be specified to meet higher test values as determined by job requirements but a minimum heavy duty tile test requirement is necessary. A portable trough for carrying mortar, bricks, etc., fixed crosswise on top of a pole and carried on the shoulder. Mortar mixed with an accelerator. A style of laying tile with each course offset one-half its length. Newly manufactured cement which has not had an opportunity to cool after burning and grinding of the component materials. A type of shower pan made of alternating layers of hot asphalt and tar paper. Mortar mixed with an accelerator. Hot pressing. - See pressing, hot, hopped-up mud. The attribute by which a perceived colour is distinguished as red, yellow, green, blue, purple or a combination of these. White, garland black colours possess no hue. Lightness – The attribute by which a perceived colour is judged to be equivalent to a member of the continuous series of greys ranging from black to white. The attribute by which a perceived colour is judged to depart from gravy of equal lightness toward a pure hue. A chemical combination of water with another compound or an element. Calcium hydroxide, a dry powder obtained by treating quicklime with Hydraulic – (cement) (mortar) those products that will set or harden under water. That degree of vitrification evidenced visually by complete wall tile which are considered impervious up to 0.5 percent water absorption. Trim tile for turning a right-angle inside or outside wall corner. Decorated by cutting or indenting the ware surface. (ASTM C 242). (Also called Stone China or Granite Ware) Historic term for adorable English earthenware. (ASTM C 242). Irregularities left on the edges of the tile due to the use mainly offhand cutting tools. A vitreous, opaque, coloured unglazed ceramic ware having white or contrasting relief-decorations and containing a substantial amount of barite. Originally developed by Josiah Wedgwood. (ASTM C242). Forming ceramic ware from a plastic body by differential rotation of profile tool and mild, the mild having the contour of one surface of the ware and the profile tool that of the other surface. (ASTM C242). A grate tampers for pushing coarse aggregate slightly below the surface of a slab to facilitate finishing. Compressible material used to exclude water and solid foreigmaterials from joints. A metal tool about 6 in. (150 mm) long and from 2 to 4 1/2 in. (50 to 100 mm) wide and having shallow, medium, or deep bits(cutting edges) ranging from 3/16 in. to 3/8 in. (5 to 20 mm) or deeper used to cut a joint partly through fresh concrete. An experienced reliable worker who has learned his trade and works for another person. Refractory clay consisting essentially of minerals of the kaolin group and which fires to a white or nearly white colour. (ASTM C242). Cement composed of finely ground, anhydrous, calcined gypsum, the set of which is accelerated by the addition of other materials. The oversize residue obtained in screening a ceramic slip. (ASTMC 242). A piece of tile cut or shaped to the letter L.
A layer of weak and nondurable material containing cement and fines from aggregates, brought by bleeding water to the top of wet concrete; the amount of which is generally increased by overworking or over manipulating concrete at the surface by improper finishing or by job traffic. The length by which one bar or sheet of fabric reinforcement overlaps another. A mixture of Portland cements, sand, and special latex additives which are used for bonding tile to back-up material. It is less rigid than Portland cement mortar. This does not imply that the glaze is nontoxic or that it contains no lead. Because of plant practices and conditions, a small percentage of lead, 0.1 to 0.2% (by dry weight), expressed as lead monoxide, and may be present. A tile wall running alongside a bathtub or abutment. This term sometimes is used to describe a narrow strip of tile wall. Tile suitable for limited pedestrian traffic such as entryways in single family residences. Specifically, calcium oxide (Cano); also, loosely, a general term for the various chemical and physical forms of quicklime, hydrated lime and hydraulic hydrated lime. A condition where one edge of a tile is higher than an adjacent tile giving the finished surface an uneven appearance. Any load that is not permanently applied to a structure. A wall designed and built to carry superimposed vertical and shear loads as opposed to no-load-bearing walls. Quarried marble, usually 3/4” thick or less, various sizes, finishes available are polished, honed, split faced, acid washed etc. A certificate that states tile listed in the shipment and described on the certificate are made in accordance with TCNA 137.1-76. A chemical mixture of organic and inorganic ingredients forming one part grouting composition that is used directly from the manufacturer’s container. A colourless or coloured ceramic glaze having low gloss. (ASTM C242). Tile suitable for pedestrian traffic such as entryways in multiple dwellings and lobbies. To change a solid into a liquid by the application of heat; or the liquid resulting from such action. (ASTM C 242). Metal quarry tile racks are available in many patterns, and they can be made to order for special patterns. They are used to maintain the same width between the quarry tiles. Terra cotta-like tile, used mainly for floors, and handmade. This tile varies in colour, texture and appearance, from tile to tile and within each tile. Available in squares up to 12 inches, hexagon, octagon, elongated hexagon, fleur de lies and other shapes. Tiles are coated with various types of sealers because of their soft absorptive characteristics. Coatings provide a wear surface for residential to light commercial use. Materials & Methods Standards Association. The act or process of mixing; also mixture of materials, such a mortar or concrete. A machine used for blending the constituents of concrete, grout, mortar, cement paste, or other mixture. The adequacy of a mixer in rendering a homogeneous product within a stated period; homogeneity is determinable by testing for relative differences in physical properties of samples extracted from different portions of a freshly mixed batch. A horizontally rotating drum mixer that charges, mixes, and discharges without tilting. A mixer designed to produce colloidal grout. A mixer having a stationary cylindrical mixing compartment, with the axis of the cylinder horizontal, and one or more rotating horizontal shafts to which mixing blades or paddles are attached. A rotating drum mixer that discharges by tilting the drum about affixed or movable horizontal axis at right angles to the drum axis. The drum axis may be horizontal or inclined while charging admixing. A cylindrical or annular mixing compartment having an essentially level floor and containing one or more vertical rotating shafts to which blades or paddles are attached; the mixing compartment may be stationary or rotate about a vertical axis. The time taken for a complete cycle in a batch mixer, i.e., the time elapsing between successive repetitions of the same operation (e.g., successive discharges of the mixer). Rotation rate of a mixer drum or of the paddles in an open-top, pan, or trough mixer, when mixing a batch; expressed in revolutions per minute (rpm) or in peripheral feet per minute of a point on the circumference at maximum diameter. The period during which the constituents of a batch of concrete are mixed by a mixer; for a stationary mixer, time is given in minutes from the completion of mixer charging until the beginning of discharge; for a truck mixer, time is given in good mixing in specific mixing speed or expressed in terms of total revolutions ate specific mixing speed. The water in freshly mixed sand-cement grout, mortar, or concrete, exclusive of any previously absorbed by the aggregate (e.g., water considered in the computation of the net water-cement ratio). The assembled, blended, co-mingled ingredients of mortar, concrete, or the like; or the proportions for their assembly. The ratio of modulus of elasticity of steel E, to that of concrete unusually denoted by the symbol N.
A concept of modulus of elasticity expressed as a function of two-time variables; strain in loaded concrete as a function of the age at which the load is initially applied and of the length of time the load is sustained. A measure of the ultimate load carrying capacity of a beam and sometimes referred to as “rupture modulus” or “rupture strength”. It is calculated for apparent tensile stress in the extreme fibre of a transverse test specimen under the load which produces rupture. (See also flexural strength.) NOTE: The actual stress in the extremefiber is less than the apparent stress since the flexure formula employed in the calculation is valid only for stresses within the proportional limit of the material. Nevertheless, the nominal rupture strength so obtained is considered the rupture modulus. Ratio of load per unit area of horizontal surface (of a mass of soil) to corresponding settlement of the surface; it is determined as the slope of the secant, drawn between the point corresponding to zero settlement and a specified point on the load-settlement curve obtained from a plate load test on a soil using a 30 in. or greater diameter loading plate. A room in which the atmosphere is maintained at a selected temperature (usually 23.0orelative humidity of at least 98 percent, for the purpose of curing and storing cementitious test specimen; the facilities must be sufficient to maintain free moisture continuously on the exterior of test specimens. An increase in dimension or bulk volume of a ceramic article caused by reaction with water or water vapour. (ASTM C 242).NOTE: This reaction may occur in time at atmospheric temperature and pressure, but is expedited by exposure of the article to water or water vapour at elevated temperatures and pressures. 2. The effects of such movement on efflorescence and volume change in hardened cement paste, mortar, concrete, or rock. 2. A form used in the fabrication of precast mortar or concrete units (e.g., masonry units). A mineral oil that is applied to the interior surface of a clean mild, before casting concrete or mortar therein, to facilitate removal of the mild after the concrete or mortar has hardened. (See also for moil, Bond breaker, and Release agent). A method of structural analysis for continuous beams and rigid frames whereby successive converging corrections are made to an assumed set of moments until the desired precision is obtained; also known as the Hardy Cross method. A single colour decoration. (ASTM C 242). Manufacturing process which allows the simultaneous firing of the clay with the glaze producing a finished tile. A single firing. A body of plain or reinforced concrete cast or erected as a single integral mass or structure. Concrete cast with no joints other than construction. The application of a 5/8 in. (15 mm) terrazzo topping directly toe specially prepared concrete substrata, eliminating an underbid. On flatwork: a higher quality, more serviceable topping course placed promptly after the base course has lost all slump and bleeding water. An organic liquid, of relatively low molecular weight, that creates solid polymer by reacting with itself or other compounds of low molecular weight. Composed of single molecules; specifically, films that are one molecule thick. Denotes a thickness equal to one molecule (e.g. certain chemical compounds develop a “monomolecular film” over bleeding water at the surface of freshly placed concrete or mortars a means of reducing the rate of evaporation). A group of clay minerals, including montmorillonite, characterized by a sheet-like internal molecular structure; consisting of extremely finely divided hydrous aluminium or magnesium silicates that swell on wetting, shrink on drying, and are subject to ion exchange. A mixture of cement paste and fine aggregate; in fresh concrete, the material occupying the interstices among particles of coarse aggregate; in masonry construction, mortar may contain masonry cement, or may contain hydraulic cement with lime (and possibly other admixtures) to afford greater plasticity and workability than are attainable with standard hydraulic cement mortar. (See also Cement, masonry and Masonry mortar). The layer of mortar on which tile is set. The final coat of mortar one wall, floor or ceiling. The mortar hoe is used for hand-mixing mortar. The best type has a perforated blade and a handle about 66” in length. The hoe should be kept clean and free of all mortar so it can be pushed and pulled easily through a box of mortar. An electric or gas driven machine designed to mix mortar. The mortar pumping machine is used with the mortar mixer. Mixed mortar is poured into the hopper, and a pneumatic gun forces the mortar through a hose. The mortar can be delivered through the hose to tile setters working as high as 13 stories above the street. Admixtures are added to the mortar as a bonder so that the mortaring the hose will not separate. The plastering gun can be used on the hose, or the hose can be used as a hoist. The mortarboard is used as a table to hold mortar. It is usually 30”square. Small tile or bits of tile, stone, or glass. These are used to form surface design or an intricate pattern. Tile assembled into units or sheets by suitable material to facilitate handling and installation. Tile may be face-mounted, back-mounted or edge-mounted. Face-mounted tile assemblies may have paper or other suitable material applied to the face of each tile, usually by water soluble adhesives so that it can be easily removed after installation and prior to grouting of the joints. Back-mounted tile assemblies may have perforated paper, fibre mesh, resin or other suitable material bonded to the back and/or edges of each tile which becomes an integral part of the tile installation. Back-mounted and edge mounted tile assemblies shall have sufficient exposure of tile and joints surrounding each tile to comply with bond strength requirements. Tile manufacturers must specify whether back-mounted and edge-mounted tile assemblies are suitable for installation in swimming pools, on exteriors and/or inset areas. Tile installed in a precise area of a wall or floor to provide decorative design or picture. Glass or marble mosaic tile (tesserae) made to form a picture or design. Ceramic tile painted and fired to form a picture or design. See Decorated and Decoration. Hydrochloric acid (30% HCL), commercial grade. A tile made by either the dust-pressed method or the plastic method, from clays that produce a dense body having a distinctive, slightly textured appearance. (ASTM C 242). Hydraulic cement in the non-hydrated state. Neat cement grout. A fluid mixture of hydraulic cement and water, with or without admixture; also the hardened equivalent of such mixture. A mixture of hydraulic cement and water, both before and after setting and hardening. A type of synthetic rubber with outstanding oil resistance. Can be used for quick-setting, high strength adhesives. This is the approximate facial size or thickness of tile, expressed in inches or fractions of an inch, for general reference. Tile having greater non-slip characteristics due to an abrasive admixture, abrasive particles in the surface, grooves or patterns in the surface or because of natural non-skid surface characteristics. That degree of vitrification evidenced by relatively high water absorption. (ASTM C 242). NOTE: The term nonvitrcous generally signifies more than 10.0 percent water absorption, except for floor and wall tile which are considered no vitreous when water absorption exceeds seven percent. A no transparent coloured or colourless glaze. (ASTM C 242). A prepared organic material, ready to use with no further addition of liquid or powders, for bonding tile to back-up material by thethinset method. Cures or sets by evaporation. Ceramic white ware for culinary oven use. (ASTM C 242). Pounds per square inch, a unit measure of pressure. Similar to quarry tile but usually of greater thickness. Felt paper and wire mesh (or metal lath) that is used as a backing; for the installation of tile. Paper mounted ceramic mosaics Ceramic mosaic tiles mounted on paper. Paper is applied to face of tile in sheets approximately twelve inches wide, twenty-four inches long. A French term designating ceramic white wares fired at relatively high temperatures. (ASTM C 242). A French term designating ceramic white wares fired at relatively low temperatures. (ASTM C 242). Unglazed porcelain or natural clay tile formed by the dust-pressed method and similar to ceramic mosaics in composition and physical properties but relatively thicker with 6 in. or more of facial area. (ASTM C 242). Reinforcing steel rod with a diameter of 1/4”. A simplified system of measuring acidity or alkalinity irrespective of the acid or alkali involved; in which neutrality is 7.0, e.g., Mineral Acid Solution is 1.0-2.8, Acetic Acid Solution or Citric Acid Solutionism 3.0-4.0, Ammonia is 9.0, Lime Water is 12.0. Those properties as measured by ASTM tests. Imperfections in the surface of a ceramic body or glaze resembling pin pricks. (ASTM C 242). Indentations in the finished surface of individual tiles other than at the corners and edges. These are caused by sharp corners on trowels and other tools of the workmen and are different than manufacturing defects. Cracking that occurs in the surface of fresh concrete soon after it is placed and while it is still plastic. A complex property of a material involving a combination of qualities of mobility and magnitude of yield value; that property of freshly mixed cement paste concrete, or mortar which determines its resistance deformation or ease of melding. Perpendicular to a true level. An additional scratch coat that has been applied to obtain a uniform setting bed on a plumb vertical plane. Mortar with a consistency of stiff paste. The mix is forcibly compressed into the tile joints where it hardens. The ratio of transverse (lateral) strain to the corresponding axial (longitudinal) strain resulting from uniformly distributed axial stress below the proportional limit of the material; the value will average about 0.2 for concrete and 0.25 for most metals. A multicolour decoration. (ASTM C 242). A thermoplastic high-molecular-weight organic compound used in formulating protective coatings or, in sheet form, as a protective cover for concrete surfaces during the curing period, or to provide temporary enclosure for construction operations. The breaking away of small portions of a concrete surface duet internal pressure which leaves a shallow, typically conical, depression. Forsterite porcelain; Steatite porcelain; Titania porcelain; and Zircon porcelain.) (ASTM C 242). The method of producing glazed ware by which a ceramic body and glaze are matured together in the same firing operation. (ASTMC 242). A ceramic mosaic tile or paver that is generally made by the dust-pressed method, of a composition resulting in a tile that is dense, fine-grained, and smooth with sharply formed face, usually impervious. (ASTM C 242). The relationship of the open pore space to the bulk volume, expressed in percent. (ASTM C 242). A method of pre-stressing reinforced concrete in which tendons are tensioned after the concrete has hardened. All fired ceramic wares that contain clay when formed, except technical, structural and refractory products. (ASTM C 242). A concrete member that is cast and cured in other than its final position; the process of placing and finishing precast concrete. A surface unit consisting of an assembly of ceramic tile bonded together at their edges by a material, generally elastomeric, which seals the joints completely. Such material (grout) may fill the joint completely or partially and may cover all, a portion or none of the back surfaces of the tiles in the sheets. The perimeter of these factory regrouped sheets may include the entire, or part of the joint between the sheets or none at all. The term edge bonded tiles sometimes used to designate a particular type of regrouped tile sheets having the front and back surfaces completely exposed. See Pressing, dry; pressing, hot; Pressing, wet. Forming ceramic ware in dies from powdered or granular material by direct pressure. (ASTM C 242). Forming ceramic ware in dies from a plastic body by dire pressure. (ASTM C 242). Concrete in which internal stresses of such magnitude and distribution are introduced that the tensile stresses resulting from the service loads are counteracted to a desired degree; reinforced concrete the prestress is commonly introduced by tensioning the tendons. A method of pre-stressing reinforced concrete in which the tendons are tensioned before the concrete has hardened. Clay which remains geologically at its site of formation. (ASTM C 242). The method of preparation of a ceramic body wherein the constituents are blended dry, following which liquid may be added as required for subsequent processing. (ASTM C 242). The method of preparation of a ceramic body wherein the constituents are blended in sufficient liquid to produce a fluid suspension for use as such or for subsequent processing. (ASTMC 242). A highly porous and vesicular lava usually of relatively high silica content composed largely of glass drawn into approximately parallel or loosely entwined fibres, which themselves contain sealed vesicles. Concrete which is transported through hose or pipe by means of pump. A thin coat of pure Portland cement which is used to bond tile to mortar. A system of procedures for selecting project or portion thereof to perform the functions intended, and assuring that these levels are obtained. A system of procedures and standards by which a constructor, product manufacturer, materials processor, or the like, monitors the properties of the finished work. Unglazed tile, usually 6 in. or more in surface area and 1/2 to 3/4in. (13 to 19 mm) in thickness, made by the extrusion process from natural clay or shales. (ASTM C 242). A method of obtaining a representative sample by dividing circular pile of a larger sample into four equal parts and discarding opposite quarters successively until the desired size of sample is obtained. A metal grid that is used to properly space and align floor tiles. The procedure of spreading a damp cloth and pulling it over the tile surface during the tile grouting process in order to clean the tile. The inclination from a horizontal direction. A joint in a masonry wall which has the mortar raked out to a specified depth while it is only slightly hardened. A glaze compounded primarily from raw constituents, that is, containing no perfused materials. (ASTM C 242). A metallic or non-metallic waterproof support for a shower stall. A trim unit used to reduce the radius of a bullnose or a cove to another radius or to a square. A pair of lines chalked on a substrate that intersect at a 90 degree angle and establish the starting point for plotting a grid of layout lines to guide in accurately setting tile. Concrete having refractory properties, and suitable for use at high temperatures (generally about 315° to 1315° C), in which the binding agent is hydraulic cement. Unit masonry in which reinforcement is embedded in such manner that the two materials act together in resisting forces. See Welded-wire fabric and Welded-wire fabric reinforcement. The ratio of the quantity of water vapour actually presents to amount present in a saturated atmosphere at a given temperature; expressed as a percentage. The ending of a small splash wall or a wainscot at right angle tithe major wall. Marquis of Rockingham. (ASTM C 242). The rod saw is one of the newest tools used in the cutting of tile. Itis a steel rod approximately 1/8” in diameter. The rod has tungsten carbide particles embedded in the surface. The rod saw is used to cut circles or irregular curves in tile. The act of preparing a surface by applying tar paper and metal lath (or wire mesh). Sometimes called wiring. The rubber trowel used for grouting is a non-porous synthetic-rubber-faced float that is mounted on aluminium back with wood handle. This trowel is used to force material deep into tile joints and to remove excess material for a perfect finish. Stretchers overlapping one another by one-half unit, with vertical joint in alternate courses. A portable source of heat, customarily oil burning, used to heat an enclosure around or over newly placed concrete to prevent the concrete from freezing. Adobe-type tile made of clay and other natural raw materials, molded and allowed to dry. Not a fired clay product. The method of obtaining tile for testing from an agreed-upon lot. Tiny pits in the surface of the tile. A system of cutting or abrading a surface such as concrete by a stream of sand ejected from a nozzle at high speed by compressed air; often used for clean-up of horizontal construction joints or for exposure of aggregate in architectural concrete. In addition to sander and grinder attachment both uninstalled and installed tile. The cutting is done dry. An on-the-job mixture of Portland cement, fine graded sand, lime and water. A cut in hardened concrete utilizing diamond or silicone-carbide blades or discs. A temporary structure for the support of deck forms, cart ways, or workmen, or a combination of these such as an elevated platform for supporting workmen, tools, and materials; adjustable metal scaffolding is frequently adapted for shoring in concrete work. Mechanical means of roughening a surface to obtain a better bond. Surface blemishes caused by scraping or other marring of the tile. The first coat of plaster or stucco applied to a surface in three-coat work; usually cross-raked or scratched to form a mechanical key with the brown coat. Tiles that have surface scratches (usually glazed wall tile) caused from sand, tools or rough handling. Any serrated or sharply tined object that is used to roughen the surface of one coat of mortar to provide a mechanical key for the next coat. Any serrated or sharply tined object that is used to roughen the surface of one coat of mortar to provide a mechanical key for the next coat. See also Scarify. The application of a scratch coat and its combing with scratches. To strike off mortar lying above the desired plane or shape. Firmly established grade strips or side forms for unformed concrete which will guide the strike off in producing the desired plane or shape. Tile with a decorative design of high and low areas melded into the finished fare. An elastomeric material that is used to fill and seal the expansion joint. This material prevents the passage of moisture and allows horizontal and lateral movement at the expansion joint. Ceramic tile with appearance defects not affecting wearing or sanitary qualities. Process to include means by which the material is held away from the supporting surface, thus creating a space for “keying” of the insulating concrete, plaster, or stucco. Having moderate gloss. (ASTM C 242). A trade term designating semi-vitreous dinnerware. (ASTM C 242). Less than 3 percent to 7 percent water absorption. The layer of mortar on which the tile is set. The final coat of mortar on a wall or ceiling may also be called a setting bed. Coarse sand of which the particles are of angular shape. A force that tends to slide or rupture one part of a body from another part of the body or from attached objects. A method of separating two materials by forcing (either by compression or tension) the interfaces to slide over the other. The force exerted is distributed over the entire bonded area at the sometime. Strengths are recorded in psi. A wall portion of a structural frame intended to resist lateral forces, such as earthquake, wind, and blast, acting in or parallel to the plane of the wall. The maximum period of time that an item can be stored before itis used. A special quarry tile having an indented pattern on the face of the tile to produce an anti-slip effect. (ASTM C 242). The splintering which occurs in fired glazes or other ceramic coatings due to critical compressive stress. (ASTM C 242). natural rubber. Consists of a pinpoint depression into the material,the material being at least 100 mils thick. A Shore A reading of 80equals a Shore D reading of 30. Company, Inc., Jamaica, New York. The floor and side walls of the shower tip to and including the curbof the shower. (CTI) Shower receptor liner or lining. Terminology used in some areas for Waterproof membrane. The decrease in volume, or contraction, of a material by the escape of any volatile substance, or by a chemical or physical change in the material. Shrinkage crack. Crack due to restraint of shrinkage. Cracking of a structure or member due to failure in tension caused by external or internal restraints as reduction in moisture content develops, or as carbonation occurs, or both. The common oxide of silicon usually found naturally as quartz Orin complex combination with other elements as silicates. Various polymorphs and natural occurrences of silica include cristobalite, tridymite, cryptocrystalline chart, flint, chalcedony, and hydrated opal. An engineered elastomeric grout system for interior use. Trim shape used on a drain board at the corners of the kitchen sink. Allowing the mixtures of mortar, thinnest mortar or grout to stand for a brief period of time after the ingredients have been thoroughly combined and before the final mixing occurs. Slaking enables the moisture in the mix to penetrate lumps in the dry components, making it easier to complete the mixing procedure. A fresh tile wall that has buckled or sagged. This condition maybe caused by excessive mortar, insufficient lime in the mortar, or excessive moisture in the scratch coat. A slide also may result if the surface is slick or the mortar is too soft. A suspension of ceramic material in liquid. (ASTM C 242). A ceramic material or mixture other than a glaze applied to ceramic body and fired to the maturity required to develop specified characteristics. (ASTM C 242). A glaze consisting primarily of a readily fusible clay or silt. (ASTMC 242). Tile having greater slip-resistant characteristics due to an abrasive admixture, abrasive particles in the surface or grooves or patterns in the surface. Description of a tile that has been cut to fit around pipes or switchboxes. This tile is usually in the shape of the letter u or the letter L.
A measure of consistency of freshly mixed concrete, mortar, or stucco equal to the subsidence measured. A mild in the form of the lateral surface of the frustum of a cone with a base diameter of 8 in. (203 mm), top diameter 4 in. (102mm), and height 12 in. (305 mm), used to fabricate a specimen of freshly mixed concrete for the slump test; a cone 6 in. (152 mm) high is used for tests of freshly mixed mortar and stucco. The procedure for measuring slump. A pure coat of very soft consistency. This also is called a slurry coat. A specific batch or lot of frit. The act of melting a batch of frit. (ASTM C 21). The method of applying a soapy film to newly tiled walls to protect them from paint and plaster during construction. The underside of a part or member of a structure, such as a beam, stairway, or arch. A generic term for unconsolidated natural surface material above bedrock. Oblong tile laid with the long side vertical and all joints in alignment. The dry ingredients remaining after evaporation of all volatile solvent or water. Not a fluid and not flow able. Describes the property of a substance to dissolve in another and form a solution, e.g., sugar is soluble in water. The process by which a substance (solid, liquid, or gas) is homogeneously mixed with a liquid, called the solvent, and the mixture being incapable of mechanical separation into its components. Alloys and amalgams are solutions of metals in metal; brines are solutions of a salt in water; syrups are solutions of sugars in water. Solution should not be confused or used interchangeably with such terms as dispersion, suspension or emulsion. In a solution, that substance which dissolves another is called the solvent. Solvent is also a common term for many liquids which are commonly used in making solutions, e.g., organic solvents, petroleum solvents, etc. Also used for thinning down a fluid, and for cleaning purposes. T-shaped, Y-shaped and cross shaped, they are used in installations to separate tile on walls and floors. They are manufactured in thicknesses of 1/16”, 1/8”, 1/4”, 3/8”, and 1/2”. keep them evenly spaced during installation. A fragment, usually in the shape of a flake, detached from a larger mass by a blow, by the action of weather, by pressure, or by expansion within the larger mass. That part of a wall between the head of a window and the sill of the window above it. A tile, either glazed or unglazed, made to meet or to have specific physical design or appearance characteristics such as size, thickness, shape, colour, or decoration; keys or lugs on backs or sides, special resistance to staining, frost, alkalis, acids, thermal shock, physical impact, high coefficient of friction, or electrical properties. (ASTM C 242). The ratio of the weight of any volume of a mass or substance tithe weight of an equal volume of water at a given temperature. The specific gravity of a substance times the density of water equals the density of the substance. Any dark dots on the tile less than 1/64 inch in diameter, and noticeable at a distance of more than three feet. A glaze defect of the pinhole type developed in the decorating kiln, due to evolution of minute gas bubbles from body or glaze. (ASTMC 242). The walls of a tile drain board or bathtub. An improper “L” cut that is made by splitting a tile instead of cutting it. Any dark dots on the face of the tile more than 1/64 inch in diameter. The quantity of adhesive per unit area applied to an adherent, usually expressed in pounds of adhesive per thousand square feet of area. 1. Single Spread refers to application of adhesive to only one adherent. 2. Double Spread refers to application of adhesive to both adherents. The ability to remain unchanged; equilibrium, steady, constant. Ability to restore to original condition after being disturbed by some force. A method of installation whereby glazed tiles are placed on the walls that they are in direct contact with the adjacent tiles. The width of the joints is not maintained by the use of string or other means. The tiles may be set with either straight or broken joints. Discoloration caused by a foreign matter chemically affecting the material itself. Highest grade of all types of ceramic tile. Curing of concrete or mortar in water vapour at atmospheric or higher pressures and at temperatures between about 100° and420°F (40° and 215° C). (See also Autoclave curing). A vitreous ceramic white ware for technical application in which magnesium met silicate (Mg - Silo,) is the essential crystalline phase. (ASTM C 242). Massive talc or the pulverized product. Thereof having the general formula 3 Mg - 4SiO, H2O. (ASTM C 242). Any ceramic white ware in which magnesium met silicate (Inigo -Silo,) is the essential crystalline phase. (ASTM C 242). The steel square is one of the most important tile setting tools. The large arm of the square is 2 ̋ wide and 24 ̋ long and is called the body or blade. The smaller arm is at a 90-degree angle to the blade and is 11⁄2 ̋wide and 16 ̋ long; it is called the tongue. The point where the outside edges of the blade and tongue join is called the heel. The surface with the manufacturer’s name is called the face; the opposite surface is called the back. A vitreous or semi vitreous-ceramic ware of fine texture, made primarily from no refractory fire clay. (ASTM C 242). Use of a carborundum stone to smooth rough edges caused by cutting. The periods of time during which a materials can be stored underspecified temperature conditions and remain suitable for use. The usual style of laying tile where all the joints are in alignment. A straight piece of lumber that is used to rod mortar and to align tile. A masonry unit lay with its length horizontal and parallel with the face of a wall or other masonry member. A process of removing excess grout from the joints by wiping with sponge or cloth or scraping with a curved instrument. Cracks or laminations in the body of the tile which detract from the aesthetic appearances and/or the structural soundness of the tile installation. Vertical member of appropriate size (2x4 to 4x10 in.) (50x 100 to100x250 mm) and spacing (16 to 30 in.) (400 to 750 mm) to support sheathing; also a headed steel device used to anchor steel plates or shapes to concrete members. A rough floor – plywood or boards – laid over joists and on which an underlayment or substrate is installed. An instrument used to test the abrasion resistance of a material. Someone who can read blueprints and is familiar with the specifications. This person makes tracings of special details concerning the tile work after gathering the necessary information and then estimates the labour, materials, tile quantities, and special trim shapes needed to complete the job. An inspection technique whereby a coin, key, or other small metallic object is tapped against an installed tile to determine by sound whether the tile is completely bonded to its backing. Tile setters often tap the tile with a pointing trowel to determine that good bond has been achieved. The pulling force necessary to break a given specimen divided by the cross sectional area. Units given in lbs. /ins. (P.S.I.). It measures the resistance of a material to stretching without rupture. Normally is not used with reference to elastic materials which recover after elongation. Island of Samos. (ASTM C 242). A trial, examination, observation, or evaluation used as a means of measuring a physical or chemical characteristic of a material, or a physical characteristic of a structural element or a structure. Testing machine device for applying test conditions and accurately measuring results. The act of determining whether ceramic tile is acceptable. See Physical properties of ceramic tile. Ability of a material to conduct heat; physical constant for quantity of heat that passes through unit volume of a substance in unit of time when difference in temperature of two opposite faces is one degree. A thick layer of mortar (more than 1/2 inch) that is used for levelling. A term used to describe the bonding of tile with suitable materials applied approximately 1/8” thick. See also Dry-Set mortar. A triangle with sides in the proportion of 3:4:5, which produces one 90 degree corner. Plotting a 3-4-5 triangle is a method used to establish a pair of square reference lines on a large surface. These lines can be used to determine if the installation site is square and to create a grid of layout lines for setting tile. A piece of marble placed beneath a door. The 18-gauge galvanized wire used in construction work. A ceramic surfacing unit, usually relatively thin in relation to facial area, made from clay or a mixture of clay and other ceramic materials, called the body of the tile, having either a glazed or unglazed face and fired above red heat in the course of manufacture to a temperature sufficiently high to produce specific physical properties and characteristics. (ASTM C 242). The cutter is one of the most efficient and economical tools in the tile setting trade. A popular model is the hand-drawn tile cutting board that is adjustable. Tile assembled into units or sheets and bonded together to facilitate handling. Mounted tile with perforated paper, fibre mesh, or other suitable bonding material applied to the backs or edges of the tile so that relatively large proportion of tile area is exposed to the setting bed. Mounted tile with paper applied to the faces of the tile. The water-soluble adhesive can be removed easily prior to grouting of the joints. In finely ground form used in glazes as a pacifier. A vitreous ceramic white ware for technical application in which Titania (Trio,) is the essential crystalline phase. (ASTM C 242). Any ceramic white ware in which Titania (Trio,) is the essential crystalline phase. (ASTM C 242). A trammel bar, which is easy to construct, is more accurate than many other layout tools. It is used to erect perpendicular lines and to bisect angles. The tile setter can make a trammel bar from a stick of a size that is suitable for the particular job. A batch of concrete prepared to establish or check proportions of the constituents. Units of various shapes consisting of such items as bases, caps, corners, mouldings, angles, etc. necessary or desirable to make complete installation and to achieve sanitary purposes as well as architectural design for all types of tile work. (ASTM C 242). The blade of the buttering trowel is 4 1/2” wide and 7” long. It issued in buttering pure cement to tile, a method commonly used in the eastern states. The trowel is more efficient than the pointer for working on the larger and heavier tiles because more weight can be placed on it. The flat trowel is used in conjunction with the hawk for the transferring of mortar from the mortarboard to the wall or to other vertical surfaces. It is frequently used for spreading pure cement finished float coat. The flat trowel also is used for spreading mortar on floor surfaces before tiles are set. The gauging trowel is larger than the pointing trowel but smaller than the buttering trowel. Tile setters prefer the 31/4” x 7” size. Notched trowels are available in the serrated, square tooth, and round designs. The teeth are made in various sizes. The correct tooth size and depth must be used to apply the thickness of bonding mortar specified. These trowels are used to apply all of the various kinds of bonding materials for ceramic tile. When the teeth become worn, the trowel has to be sharpened or replaced. See Decoration, underglaze. Unglazed paver tile. See Pavers. A hard, dense tile of homogeneous composition throughout, deriving colour and texture from the materials of which the body is made. The colours and characteristics of the tile are determined by the materials used in the body, the method of manufacture, and the thermal treatment. (ASTM C 242). An elastomeric polymer with excellent chemical and water resistance. Single component (moisture cure) and 2-part (chemical cure) systems are available. Both types may be applied in a fluid state and cure (polymerize) after installation. Typical tile industry applications include sealants, caulks, waterproofing membranes, and high performance flexible adhesives. Waterproof membrane placed under concrete floor slabs that are placed on grade. V-shaped trim tile used on the front edge of a countertop. The tile ‘stop surface is gently curved upward at the front edge to prevent water from running onto the floor. A semi-mat glaze having a satin-like appearance. (ASTM C 242). Style of laying tile with each vertical row of tile offset for half its length. That degree of verification evidenced by low water absorption (See also Impervious; No vitreous; Semivitreous.) (ASTM C 242).NOTE: The term vitreous generally signifies less than .5 per rent absorption, except for floor and wall tile and low voltage electrical porcelain which are considered vitreous up to 3.0 percent water absorption. A slip coating matured on a ceramic body, producing a vitrified surface. (ASTM C 242). Tile with water absorption of more than 0.5 percent, but not more than 3.0 percent. (ANSI A137.1-1980). The progressive reduction in porosity of a ceramic composition as a result of heat treatment, or the process involved. (ASTM C 242). The maturing range of a vitreous body, producing a vitrified surface. (ASTM C 242). An unfilled space in a material of trapped air or other gas. The lower part of an interior wall when finished in tile. A glazed tile with a body that is suitable for interior use and which is usually no vitreous and is not required nor expected to withstand excessive impact. A concave or convex curvature of a tile so that the surface is not perfectly flat. The ability to take up and retain water. The ratio of the amount of water, exclusive only of that absorbed by the aggregates, to the amount of cement in a concrete or mortar mixture; preferably stated as a decimal by weight. The water level is a piece of clear plastic hose 3/8” to 1/2” in diameter and usually about 50’ in length. It is filled with water, from which all air must be removed. A topping or surface treatment to increase the resistance of concrete pavement or slab to abrasion. Changes in colour, texture, strength, chemical composition or other properties of a natural or artificial material due to the action of the weather. A series of longitudinal and transverse wires arranged substantiality right angles to each other and welded together at all points of intersection. Welded-wire fabric in either sheets or rolls, used to reinforce mort and concrete. Aggregate having a particle size distribution which will produce maximum density, i.e., minimum void space. Tile surfaces that are either soaked, saturated or regularly and frequently subjected to moisture or liquids (usually water) such as gang showers, tub enclosures, showers, laundries, saunas, steam rooms, swimming pools, hot tubs and exterior areas. See Pressing, wet. Wet process. See Process, wet. The thorough impregnation of a material by a liquid. The more viscous a fluid, and the higher its surface tension, the more difficult it is for the liquid to “wet” materials. Certain additives, such as, water softeners, reduce surface tension or viscosity and improve wetting properties, allowing the material to be better absorbed. Calcium carbonate powder of high purity. (ASTM C 242). The wood float is sometimes used in place of the flat trowel for floating mortar. It is good for smoothing small irregularities left on the mortar bed, working the surface of the mortar before trowelling the pure coat, or compacting floor and deck mortar. The property of freshly mixed concrete or mortar which determines the ease and homogeneity, with which it can be mixed, placed, compacted, and finished. Pertaining to ceramic mosaics mounted on paper. Due primarily thorough handling in shipment. A yellow semi-vitreous ware or earthenware with a colorlessclear glaze. (ASTM C 242). Credit to the Australian Tile Council, tiles.co, TCNA and tile-assn.